By Trolley, Train, Show Boat Or Surrey, These Musicals Will Move You When we asked movie critic Bob Mondello to contribute to our Book Your Trip series, he immediately began humming show tunes. Spend six minutes listening to this story and you'll be singing along, too. Barbra Streisand does a lot of singing on transit — over the course of Funny Girl, Funny Lady, Yentl and Hello Dolly (above) she sings aboard a train, a plane, a taxi a tugboat, and an ocean liner. When most people hear about NPR's Book Your Trip series (about transit-themed summer reading) they suggest book titles. But when movie critic Bob Mondello heard about it, he started humming show tunes. And that's what you'll be doing too, after you listen to this story about "trip" musicals — shows that transport you by car, boat, train, plane or surrey with a fringe on top. Click the listen link at the top of this page, and then watch the musical numbers below. Enjoy the journey! In Funny Girl, Barbra Streisand sings "Don't Rain on My Parade" on a train, in a taxi, and on a tugboat. She's taking off in a plane in "Let's Hear it For Me" from Funny Lady. 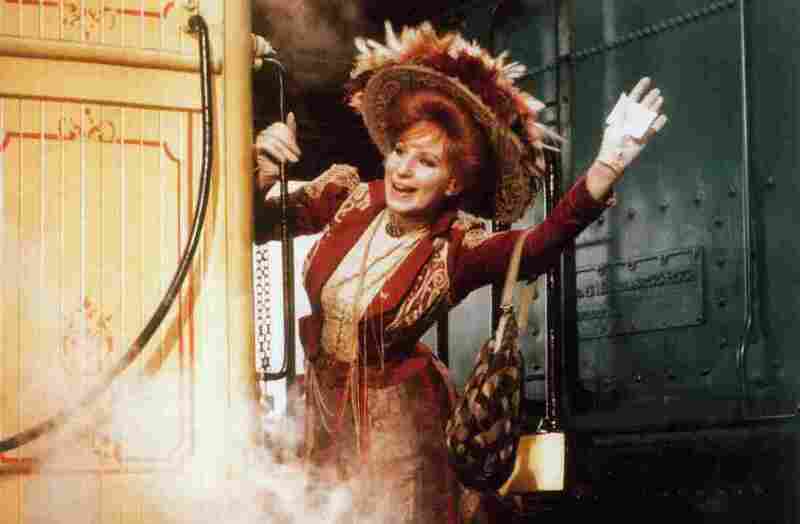 And in "Put on Your Sunday Clothes" from Hello, Dolly!, she's on a train calling "All aboard! All aboard!" Streisand sings "A Piece of Sky" from the deck of an oceanliner at the end of Yentl. Clang, clang, clang went the trolley as Judy Garland sings to fellow passengers in Meet Me in St. Louis. Garland takes a ride "On the Atchison, Topeka and the Santa Fe" in The Harvey Girls. Garland and Fred Astaire tap out a train-themed "When the Midnight Choo-Choo Leaves for Alabama" in Easter Parade. In the opening number of The Music Man propulsion is built into the lyrics; a train full of salesmen talk business and their words mimic the rattle and clatter of the tracks. "Chicks and ducks and geese better scurry" when Gordon MacRae sings "The Surrey with the Fringe on Top" with Shirley Jones in Oklahoma! "Greased Lightning" burns up the quarter mile in this four-wheel homage in Grease. Most of the musical Show Boat takes place on a Mississippi paddle-wheeler. W.S. Gilbert and Arthur Sullivan's H.M.S. Pinafore takes place aboard a British ship. On the Twentieth Century is set on a 1930s train that raced between Chicago and Manhattan. This number is perhaps the ultimate traveling song: It doesn't change tempo, it doesn't have a chorus, it propels you forward, and it (seemingly) never ever, ever ends. We couldn't possibly fit all the travel-themed show tunes into six minutes. We hope you'll leave your favorites in the comment section below.